Being a newlywed, there are a lot of exciting things happening. 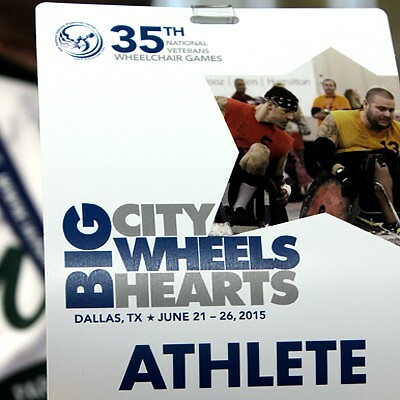 After getting back from our wedding, my husband and I were fortunate enough to volunteer for the Minnesota Paralyzed Veterans of America during the 35th National Veterans Wheelchair Games in Dallas, Texas on June 21-26, 2015. It wasn’t the traditional honeymoon most couples take, but for us it was exactly where we wanted to be. We hit the road the Friday before the Games started. It was a straight shot on Interstate 35 South from Minneapolis to Dallas. All loaded up with the athletes equipment, we caravanned with other long-time volunteers for the MN PVA who were kind enough to invite us along. We stopped just before Kansas City for the first night to get some rest and prepare for the longer drive on Saturday. The night was filled with great conversation about the upcoming competition and “as good as you can get” gas station dinner. The next morning we were given a positive omen as we were fueling up. We were greeted by dozens of National Guard soldiers from Jefferson City, IA who were on their way to Missouri. After thanking them for their service we were on our way. After 12 hours (and a few Red Bulls) we arrived at the Sheraton in downtown Dallas where the majority of the athletes were staying. The cityscape was quite spectacular in the early evening hours however what we saw at the main entrance of the hotel was even more of a sight! So many athletes were gathered to reconnect and say hello to one another. It was like a big family reunion! After unloading the quad rugby chairs, hand cycles, bowling balls, archery bow, softball bats, etc., we headed over to the Kay Bailey Convention Center for the Opening Ceremony. This was a sight to see with over 600 athletes in wheelchairs gathered by state ready to be called into the main arena. State by state, the veterans rolled in to thundering applause and cheers. I was on the floor taking pictures and to capture the energy was something I will never forget. Some had smiles, others had tears. Every way you looked at it you could see the emotion that came from the journey each veteran has taken to get to this point. We were addressed by the Mayor of Dallas, the Governor of Texas, and even a letter from former President George W. Bush. The pride and patriotism was palpable that night. The first events started on Monday morning and went back to back through Friday afternoon. With 19 different events we were able to witness determination and courage every hour. Some of the highlights include the Boccia Ball game which went until midnight. The convention center’s lights were programmed to dim at the stroke of 12 however the athletes powered on to finish their rounds. Watching the athletes who have extreme limitations grasp the ball to send it down a ramp with such precision and mental toughness is eye opening. We will never take for granted the use of our hands again after witnessing these athletes do the unthinkable. One of the MN athletes, Jerry, was one of the last to compete and despite the time of day he was all smiles and even had a few jabs to his competitor. He was able to take home gold after all! One of the most talked about moments when Gerald, another MN PVA member, beat out Al Kovach, the National President of the Paralyzed Veterans of America in not just Boccia Ball but in Nine Ball. Gerald couldn’t believe it and he was smiling from ear to ear with his bronze and gold medals. We got to chat with Mr. Kovach and his wife who were so nice. We discussed ways we can help promote the PVA to new members and the community and are excited to do whatever we can. 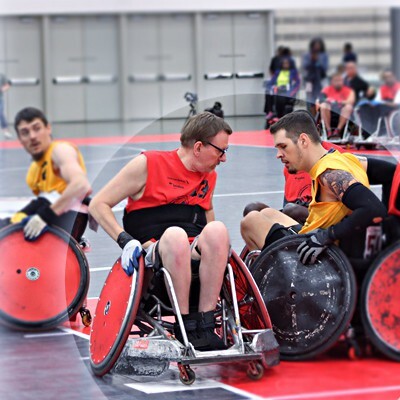 Quad Rugby is unlike anything else we have ever seen. The athletes have specialized chairs that are built to withstand incredible force from athletes literally crashing into one another. It was hard to watch at first because of how hard the hits were. After a little while though, I was right with the rest of the crowd cheering on hit after hit and goal after goal! Everyone was talking about the Slalom events coming up and it was definitely an athlete and audience favorite. The easiest way to describe this event is an intense obstacle course that the athlete has to get their chair through in as little time as possible. The obstacles were anything from sand, steep ramps, mattress, chains, etc. To an able bodied person it might look easy but that couldn’t be farther from the truth. These athletes really had to work hard. Those with the best times were invited to compete in the Super G Slalom which was even more challenging and dangerous. We saw athletes fall out of their chairs several times but no one ever gave up. As hard as the course was their mental toughness persevered. Even though this was an individual event, there was no shortage of working together as fellow athletes shouted tips and provided encouragement. I am sure there were many inspiring moments, but for me personally it was one Marine who left me speechless. She was a determined from the first second she rolled onto the course. With “Semper fi” on her shirt, she fought hard through each obstacle. She got stuck in the bungee cords in one area and ended up falling from her chair. She didn’t give up. She pulled herself back up, gritted her teeth and pushed on. There was the loudest applause and the crowd was chanting her name – “Kory, Kory”. Being able to see her eyes and the determination to finish will always be in my mind. I couldn’t hold back the tears any longer. I was so moved by her fight. I never did learn her name because as she finished she was surrounded by her loved ones and other athletes. But if she were to ever read this, I would want her to know how much of an inspiration she is. Thank you for that…I will never forget it. After spending hours outside at the archery fields, we learned that the Dallas heat is no joke, especially being from Minnesota. Yet, the athletes never complained. They stayed strong each and every time they released another arrow. It is truly impressive watching these athletes, some working so hard to get the string back, others hitting the bulls-eye consistently. Hank from the MN PVA made history during the Games in Alaska a few years ago. He shot a bulls-eye then on his next shot, split that arrow with another arrow. They call it the “Robin Hood”. Another veteran from Puerto Rico achieved it this year and the crowd loved it! In five days, with 19 different events, and over 600 wheelchair athletes, I have to say that the National Veterans Wheelchair Games was the most powerful sporting event we have ever experienced. These Games were more than competition for these soldiers. It offered them camaraderie and compassion. It gave us determination and inspiration. The Games helped us understand and overcome the fact that we all have different abilities and challenges in life. But with that we all have the same choices when faced with adversity: give up, give in or give it all you got. These athletes demonstrated greatness by giving it all they had. 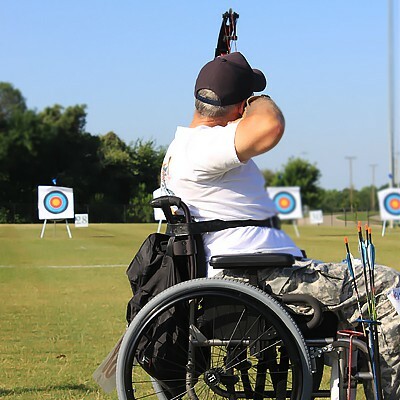 That is why we must honor every veteran and continue to support them in the National Veterans Wheelchair Games. We must remind them that no one fights alone.